“Which would energize me (or anyone) more as a creative business professional? Creating content that has the primary purpose of driving the sales pipeline and a secondary purpose of improving the life of my user. Creating content that has the primary purpose of improving the life of my user and a secondary purpose of driving the sales pipeline. I believe most marketers would agree with Marc in theory but not in practice. The moment we stopped saying, ‘We’re pool builders,’ and started saying, ‘We are the best teachers in the world about Fiberglass pools and we just happen to install them as well,’ … that was one of the most prosperous days of our lives. Before this, River Pools was like every other pool company – it installed pools. What became the difference in River’s success was moving the product from primary to secondary in the mission. What do you sell? Most likely, what you sell is primary to your company’s mission, which is then passed down to your content marketing mission. Do you know what this creates? Self-serving content that does nothing for the audience and wastes time and resources of the brand. Let’s consider a large enterprise like 3M as an example of what you should be doing. Over the next five years, the majority of 3M sales will come from new products. If 3M focused its mission around specific products and services, it would not only be impossible (3M provides thousands of products), its mission would constantly change because the products change. In reality, 3M’s mission is all about helping people live a better life through advancements in science. This is a noble mission on which to base the direction of its content – focused on the needs of the audience with a specific content tilt (science). This is why most marketers are so terrible at content creation. The “why” to most marketers is about driving demand and selling more widgets. It seems too simple, but yet almost all brands get this wrong. We focus on what our organizational goal is and create content we believe drives that organizational goal. This works in advertising, why shouldn’t it work in content marketing? Sure, the organizational goal (e.g., sales, savings, customer loyalty) is important, but to hit that goal, we have to put all focus on the needs and wants of the audience. How can we be so useful and impactful to the audience outside of the products and services we sell? To Marc’s earlier point, the primary goal has to be focused totally on the audience, and the business goal needs to be secondary. Or, maybe better said, you can’t reach the business goal without first serving the needs of the audience. Once we deliver consistent value to our audience – and they begin to know, like, and trust us – then we can extract value from that relationship. Do you want a better lead-generation program? Then focus all your energy on building ongoing subscribers to your content, and THEN create leads from your subscriber base. We’ve worked with hundreds of B2B companies in the past six years and literally no one does this. Let’s take CMI for example. We believe in Marc’s point in both theory and practice. Our mission is to advance the practice of content marketing so that enterprise marketers can be more successful in their jobs – getting buy-in for the practice, showing return for the investment, and organizing the approach so they are successful. That’s the primary focus for CMI. How do we “show” return for our efforts? We build an audience of subscribers to the content itself. Once we have an ongoing relationship with them (around their needs), and they begin to know, like, and trust us, then (and only then) do we present products (like Content Marketing World) in front of them that align with that audience need and helps CMI’s bottom line. Marriott believes that if it can solve its audience’s travel problems consistently, that audience will be more likely to stay at a Marriott. Indium believes that if it can solve its audience’s needs around industrial soldering equipment, the audience will be more likely to buy Indium’s soldering equipment. In contrast, if the real why to creating your content is an internal business goal, odds are 99-1 against success. You may be asking why this is so important. Here it is. This video from comedian Michael Jr. was going around Facebook last month. It’s worth the three minutes. Go ahead, I’ll wait. When people talk about their content marketing, they talk about the WHAT … the blogs, the podcasts, the videos, the events, the social posts. But the WHAT doesn’t matter if the WHY is lacking. The WHAT doesn’t matter if the WHY is lacking. Nobody cares about your products or services. If your why is based on selling more shoes or consulting services or routers, your WHAT will have no soul. Your content will be wanting. Why you exist is not your product. Your why is the problem your product solves. If you are reading this far, odds are you are in this exact situation. Changing your WHY is desperately challenging. It’s a cultural shift, which always takes time. IT MUST BE DONE. Start slowly but begin now. Presenting a visual content audit could be a solid first step. Just place samples of your content in front of your executive team and have them engage with the content you produce. Is the content in line with your brand’s deeper mission or does your content exist solely to pitch your product? Your findings may uncover that some of your WHAT should cease to exist until you can get your WHY straightened out. Good luck. Want to learn more and be inspired by businesses that follow a subscriber-first model? 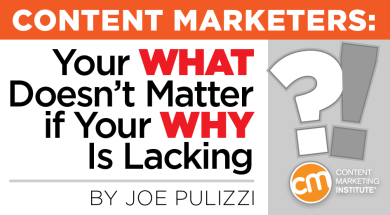 Check out Joe’s newest book, Content Inc.